I don’t think it’s possible to survive long in a country that’s not your own if you don’t have some grit about you. One of the very best things for me about life as an expat was becoming friends with some of the strongest people. Some of them have had to “shape shift” along the way to make the most of their existence abroad, and (as is typical of the character of many of these people) they learn to greet whatever life flings at them in an inspirational way. Heather, a friend of mine is a perfect example. You might remember her as she has previously written a guest post on the blog, and now as she promotes her newest book, I wanted to give her a little mention on here too. I’ve written and published two books so far in my life. There are more floating around under my tightly knotted headscarf; this fabric not only keep my brains warm in the damp chill of yet another grey winter in Denmark but to also give me a mini face lift and a pleasingly “startled”, as opposed to “saggy”, look that lovely Ava Gardner once recommended as a beauty trick. This headscarf/bandage/turban has another purpose too; it says to my grey, black and pale pink-clad neighbours and the inhabitants of the small, grey, homogeneously white and affluent town where I live in Denmark that I am different. I don’t give a damn, I’m foreign, wise, proud, funny and about to use it. Perhaps as a British woman, my timing might seem unusual, as the tolerant country that I once knew implodes, divided and in confusion over Britain’s place in or out of Europe. 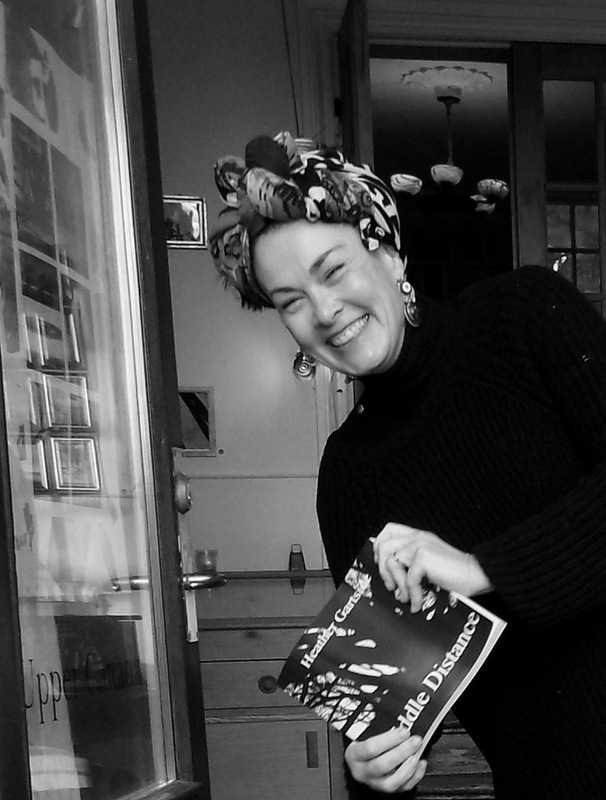 But I am foremost a European and will sweep my own doorstep and lead the life that my headscarf suggests – that of a European eccentric, if not as an English one abroad now that I’ve felt obliged to apply for Danish citizenship. 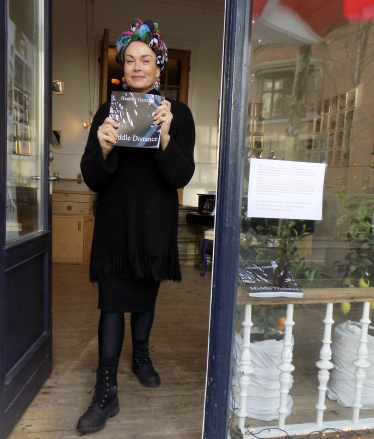 On a grey day in Copenhagen, when the weather is all cloud, and the fine rain strikes you from below and permeates on all sides, my turban sits tight and dry in the warmth of the little gallery in Frederiksberg where I exhibited the illustrations which accompany my latest book, Middle Distance. Both of the books are novels but are very closely tied to events that have happened in my life. “Rice Pudding in a Duvet, second helpings” is a coming of age novel. Everything close to my own heart, but blended with a dash of magic, a pinch of sea salt and written in a time when I was on a happy plateau of contentment. All the ingredients were in place – of a warm and loving family, a pretty house with high ceilings in a provincial town in Denmark, a dog, adequate money, good health, the chance to travel occasionally and always something nice cooking for dinner in our home. Rice Pudding In A Duvet was published, loyal friends were badgered and spammed endlessly by me to purchase the book in a year-long campaign reminiscent of a Tupperware party, and normal life continued in that small Danish town. There were those normal niggles that we get when approaching mid-life, the mid-life crisis I think they call it. I was chomping at the bit; finding the provincial town too small, my life too boring, my bum too big, the house too small, not enough travel, and getting sick of waking up next to an increasingly old looking man. I’d lost my sense of contentment. My husband too was busy having his male menopause and getting stressed; looking to his friends who had more money, more scientific papers published, better cars, a summerhouse by the sea, one in the sun – he’d lost his sense of happiness as he woke-up once more to his next to his increasingly old looking wife. We were arguing more, not nasty loud rows that would upset the kids, but sharp comments, fewer kisses, less time spent together – less joy. Christmas came and went, it was nice in a boring way. I continued feeling dissatisfied, my husband continued getting stressed, eating stupidly, and doing either no exercise or too much. Then, one January evening four years ago “BANG” he fell on our family sofa, had a massive heart attack and died. My first thought was, “No, I never wanted change to happen like this!” – but you never get to chose the package in which your wish arrives in. Then – frantic resuscitation with the help of those happy children with their golden childhoods (which effectively ended there) – and a miracle happened, he came back to life and my second novel, Middle Distance began. Now, that could have been the ending of the first novel, but the contrast from the happy valley in which we had frolicked, to the state of emergency we were plunged into, was too intense. There followed many days, weeks, months, then years of recuperation, where my strong husband beat all the odds set so heavily against him for a full recovery. How good is that? 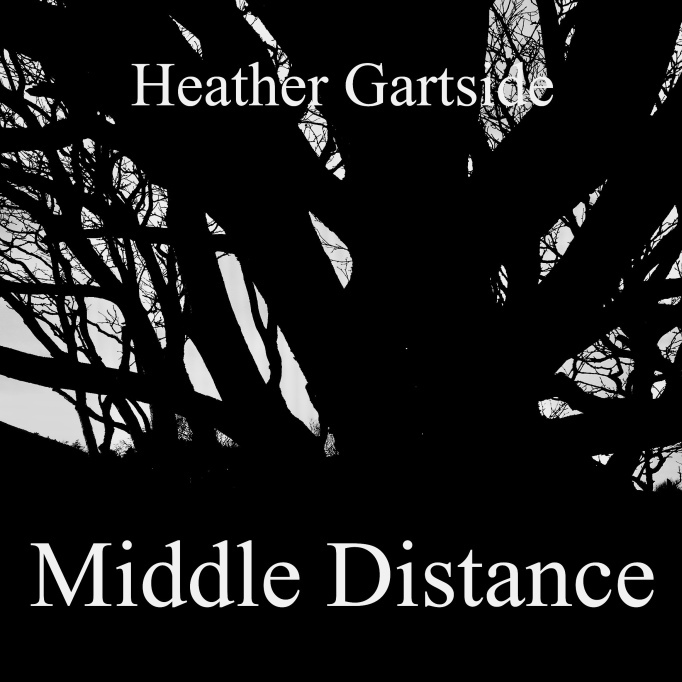 But the plot of Middle Distance is all about an unnamed woman, who struggles with the traumatic aftershocks of a devastating accident, and who descends into a sepia-tinged underworld of nonacceptance of the change that had been thrust upon their family. A woman who pined for her old life, for the boredom of normality, for the innocence that she’d lost and for the loss of the man that she used to know. So I searched for an ending, and the quest began to regain a sense of contentment by being handed the biggest key, and that was something only that a journey into the soul could find”. You can also find Heather on her Walking Tours of Copenhagen, and in her newest venture – KIND.DK. Good luck with your book too Ashleigh! The books sound fascinating and something positive to come out of a very difficult time. Glad to hear that Heather’s husband is getting better again. Thank you Nancy, it really does doesn’t it? Congratulations to your lovely friend. I totally understand what is written here. I will read her book. Congratulations to your lovely friend, and well done you for being just as lovely! So many big themes, how sad that you feel you have to relinquish British citizenship (although in that you just one of many of my acquaintance), thank goodness for miracles and how do you tie a head scarf? Congratulations to your friend on her latest book release! Hahaa!! Love the mini face lift hack! I’m off to try it. I wish I could wrap and tie headwraps. The little boutique to share your pictures sounds amazing and the books sound like such an interesting read. wow this sounds a really interesting book, and an interesting thing that Heather is doing with her KIND venture. Thanks so much Rebecca, it sounds great doesn’t it? Wow!! That made me cry, my feelings came alive because me too, I am a foreigner. Living in Britain is not easy these days, I am feeling very confused as I want to stay but the country I once loved , the country I adapted as a home does not want us anymore, very sad. Maybe I should also wear a head scarf around my head and…..! But I am not strong enough. I just want a happy and peaceful family life, maybe it is time we should go back home as you Emma.